Rain predicted for Friday evening into Saturday – Welcome to Wyandotte Daily! 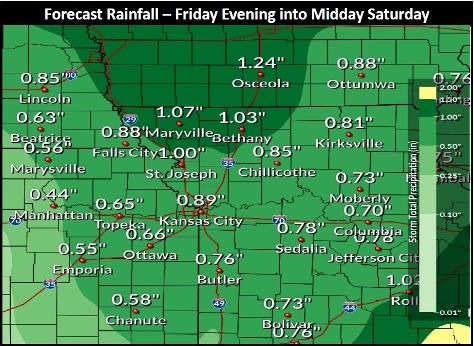 Rain returns to the area Friday evening into Saturday, according to the National Weather Service. Forecast total rainfall amounts are expected to mainly range between one-half to one inch, the weather service said. A few weak disturbances early next week may provide a few chances of wintry precipitation, but as of right now confidence is low for any significant accumulations, according to the weather service. Today will be cloudy, then gradually becoming mostly sunny, with a high near 43, the weather service said. The wind will be from the east at 3 to 5 mph. Tonight, patchy fog is in the forecast between 9 p.m. and 3 a.m., according to the weather service. There may be areas of freezing fog after 3 a.m. Otherwise, the low will be around 30 with a light north northeast wind. Friday, there is a 30 percent chance of showers after noon. Before noon, there is a chance for areas of fog. Otherwise, it will be mostly cloudy with a high near 44, the weather service said. A light northeast wind will become east 5 to 10 mph in the morning. Friday night, there is a 90 percent chance of showers and possibly a thunderstorm before midnight, according to the weather service. Rain is possible after midnight. The temperature will fall to near 43 by 8 p.m., then rise to about 50 during the remainder of the night. An east wind of 7 to 13 mph will gust as high as 20 mph. Between three-quarters and one inch of rain is possible. Saturday, there is a 40 percent chance of rain, mainly before noon, the weather service said. It will be mostly cloudy with a high near 50. A southeast wind of 7 to 13 mph will become west in the afternoon. Winds may gust as high as 26 mph. Less than a tenth of an inch of rain is expected. Saturday night, it will be mostly cloudy, with a low of 34, according to the weather service. Sunday, there is a 30 percent chance of rain before noon, with a high near 40, the weather service said. Sunday night, there is a 40 percent chance of rain and snow between midnight and 1 a.m., then a chance of snow after 1 a.m., according to the weather service. The low will be around 30. Monday, there is a 50 percent chance of snow before 11 a.m., then a chance of rain and snow between 11 a.m. and 2 p.m., then a chance of snow after 2 p.m., the weather service said. The high will be near 35. Monday night, there is a 30 percent chance of snow before midnight, with a low of 22, according to the weather service. Tuesday, it will be mostly cloudy with a high near 30, the weather service said. Tuesday night, it will be partly cloudy, with a low near 20, according to the weather service. Wednesday, it will be mostly sunny with a high near 31, the weather service said.